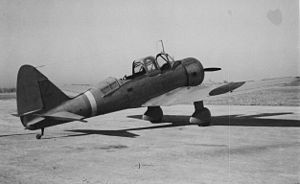 The Tachikawa Ki-36 (named Ida in Allied reporting code) was a Japanese army-cooperation aircraft of World War II. It was a two-seat, low-wing monoplane with a single piston-engine and a fixed, tailwheel-type undercarriage. The prototype, fitted with a 450hp (336kW) Hitachi Army Type 98 Ha-13 engine, first flew on 20 April 1938. Having outperformed the Mitsubishi Ki-35 in comparative trials, the Ki-36 was designated the Army Type 98 Direct Co-operation Aircraft and ordered into production in November 1938. Production ended in January 1944 after a total of 1,334 had been built. The Ki-36 first saw action in China where it saw success. Later, in the Pacific, it proved excessively vulnerable to opposing fighters. It was theeafter redeployed to the safer theatre of China. Towards the end of the war, the Ki-36 was employed as a kamikaze aircraft with a bomb of 500-kg (1,102-lb) fitted externally. Ki-72 : An evolved version with a 600-hp (447-kW) Hitachi Ha-38 engine and retractable undercarriage, not built. Chinese Communist Air Force operated 2 captured aircraft postwar as trainers until their retirement in early 1950s. one fixed, forward-firing 7.7mm (0.303in) machine-gun , one flexible 7.7mm (0.303in) machine-gun in rear cockpit. up to 150kg (331lb) external bombload. Francillon, Ph.D., Ren� J. Japanese Aircraft of the Pacific War. London: Putnam Aeronautical, 1987. ISBN 0-85177-801-1.